Several missives arrive taking the Shuttle to task for claiming the famous missing show belonging to Prime Minister Julia Gillard was a Mixxy shoe designed by one of the USA's top fashionistas Betsey Johnson. 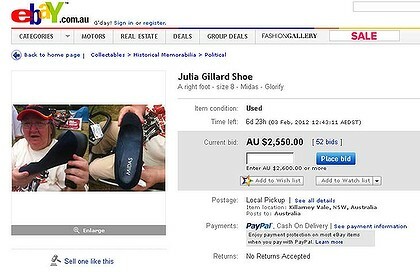 The shoe appeared for sale briefly on Ebay today before the advert was pulled. In fact the shoe was a Midas brand with the name GLORIFY as featured in our snap below and it sells for a hefty $A148 and not the mere $US87 that the Mixxy sells for. 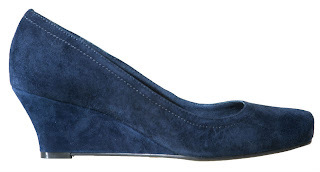 Classic pump outline medium heel wedge. Super soft suede all leather lined available in black and navy. Perfect for the office, political escapes and finding the burley bodyguard of your dreams. !!! !